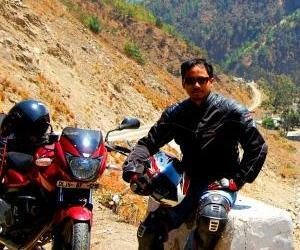 A look at how the world's premier motorsport event has managed to influence a Biker Next Door from India.. Imagine Lorenzo wearing "एक कदम आगे" on his forearm..!! Any guess which is the most MotoGP crazy nation of the world? Italy and Spain may be producing lots of MotoGP champs but if Google Tends is to be believed (screen shot posted below), it is Indonesians which are clearly ahead in terms of internet search related to MotoGP. 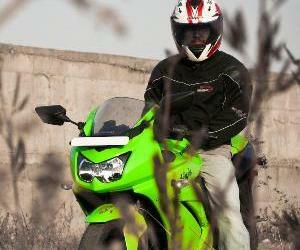 Motorcycles sales currently account for a mere 10% of the 3rd largest 2 wheeler market of the world (Indonesia), the remaining 90% comprises of step thru and automatic scooter models. In spite of being a traditionally non-motorcycle market, MotoGP seems to be one of the most popular and followed sporting event amongst Indonesians. Google Trends search for "MotoGP"
Watch the 2010 TV Commercial of the "Yamaha Jupiter MX" Step Thru, featuring Valentino Rossi (Ex-Yamaha rider and MotoGP Champ)..!! 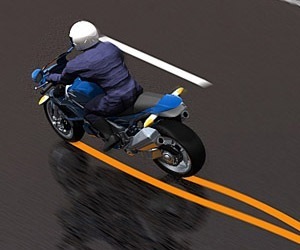 One important phrase in this MotoGP crazy nation is “Semakin Di Depan”, which when translated into English from Bahasa (Indonesian) means “One Step Ahead”. This phrase happens to be the official tag line of Yamaha Indonesia. In 2010 this phrase appeared on the Yamaha M1 MotoGP bikes and also on the forearms of the Yamaha riders (Rossi and Lorenzo)..!! 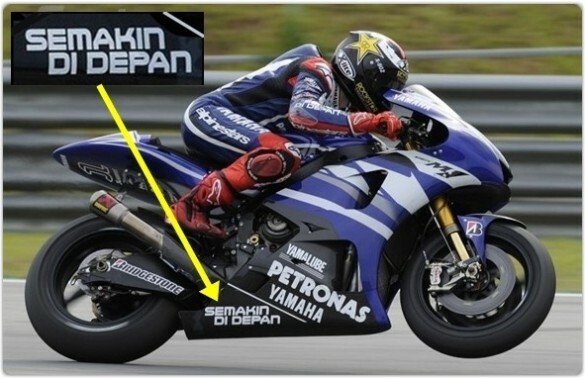 Even in 2011 the same phase can be found on the Yamaha M1 bikes currently ridden by Lorenzo and Ben Spies (factory Yamaha MotoGP riders) and also on their forearms. 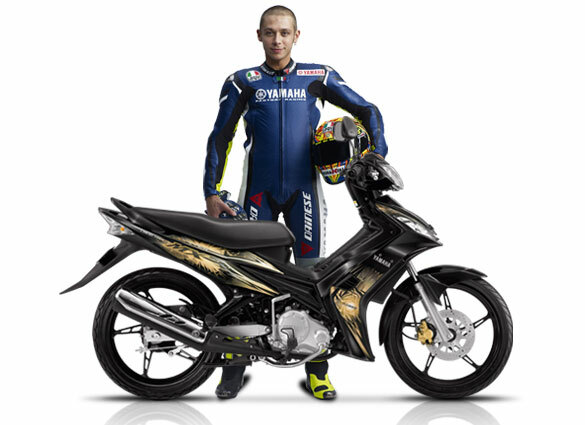 Yamaha Indonesia has tried to cash in on the craze for MotoGP in Indonesia. No wonder than Yamaha is currently neck to neck with Honda in terms of 2 wheeler market share in Indonesia. 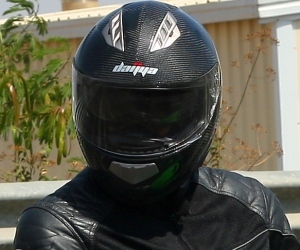 Imagine Lorenzo wearing "एक कदम आगे" on his forearm and on his bike. I guess you get the picture. We Indians like Mac Donalds or KFC's, but only when it is stuffed with “paneer tikka” or “chicken tikka”. We like our MTV but only when it runs Bollywood numbers or Indian fusion on it. We like wholesome family entertainers like "3 Idiots" and "Dabang", replete with song and dance numbers. When it comes to sports, we need a team/figure with whom we can associate and start rooting for that team/sportsman. The Mahindra team which have a cash rich Indian promoter but without any desi blood steering its bike, it would be just like Dr. Vijay Mallya’s “Kingfisher” Force India F1 team with no Indians to cheer for. In short, you one buy out a foreign team and give it an Indian name but as long as the “Paneer Tikka” is missing in the form of an Indian talent, the connect with the common Indians won't be there. I had posted earlier that since our Indian teams Mahindra and WTR-Ten10 will be participating in the 125 cc class this year, I might start following MotoGP. So last weekend I did watch the race held at Assen (on TV of course). It was the seventh race in a total of eighteen for this season. I accept that I am late, but it’s a start for a MotoGP virgin like me. 125 cc class: Throughout the race instead of following the leading group, I was more interested in the list that used to come on the TV screen, which let me know about the position of the Mahindra riders in the race. At the end, the 9’th and 13’th places for the Mahindra team was the best result for them in this season. 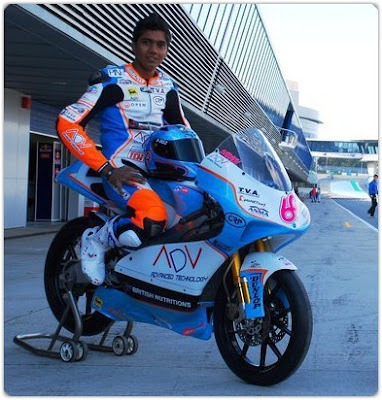 Sarath Kumar (from the WTR-Ten10 team) created history by becoming the first Indian to participate in a MotoGP (125 cc class). But he has so far just managed to feature only in a single race (he finished last in it). Post that race, he has been replaced due to an injury with a foreign rider. With no Sarath in the Assen race, I wasn’t keen on looking out for WTR-Ten10. I know it’s very tough just to qualify and finish the race. It might be a big achievement just to get into the top 10 positions. But for a spectator like me, it is far from being fun or exciting to get to know about your favorite team’s standings from a list rather than watching the riders slug it out in the race. Moto2 (600 cc class) : With no team to root for, I was like a lost puppy during the race. With quite a few crashes it was an eventful race though. Moto GP: After hearing a lot about Valentino Rossi over the years, so I made him my favorite for the race. But it seems that this season Mr. Rossi is finding it hard to adjust to his new team and bike (Ducati). Rossi ultimately finished 4’th. Q. So would I like to follow the next race of the season? Ans: If Sarath would qualify, I would definitely like to. Else, I can always read the race results from the MotoGP site. With the "Buddh International Circuit" coming up in Noida, F1 in 2011 and hopefully MotoGP in 2012 should arrive in our nation of 1 billion plus (with a burgeoning middle class) population. But all said and done, till there is an Indian talent to add “spicy masala” at MotoGP and hopefully start making podium finishes, Cricket would still continue to be the number one sport in India for a long time to come. 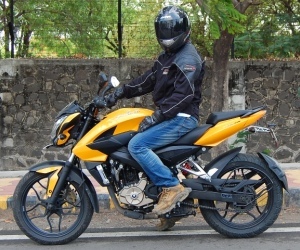 Motorcycles happen to be my passion, but I do not have any pretension to accept that like a common Indian, my interest lies in Cricket and not in MotoGP or motorsports (at least till now). nice words, but the indonesian words not only on the Yamaha team, that also written on the Honda RCV212 "Satu Hati" its means One Heart. india is a growing market..but we are not at even indonesia's level..
you are right about paneer tikka example..
but consider F1, if karthikeyan and chandok raced for force india..it wouldnt get hype as much as it does by racing with fisicella/sutil and di-resta .. but thats just my observation..
@roda2blog, thanks for the additional info bro.. didn't know Honda too had a similar strategy for Indonesia.